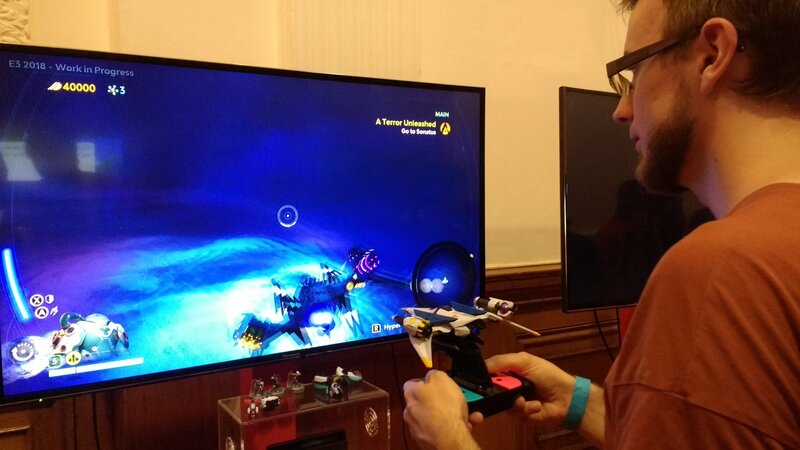 At the NintendoUKVS event in London we got our first chance to try out the E3 version Starlink: Battle for Atlas after that surprise reveal showed Nintendo’s legendary Fox McCloud would be lending a hand as a playable character, Arwing and all. We’d passed over Starlink’s initial announcement the year before, but Nintendo’s willingness to throw a first-party character into Ubisoft’s space adventure was a surefire way to catch our attention. 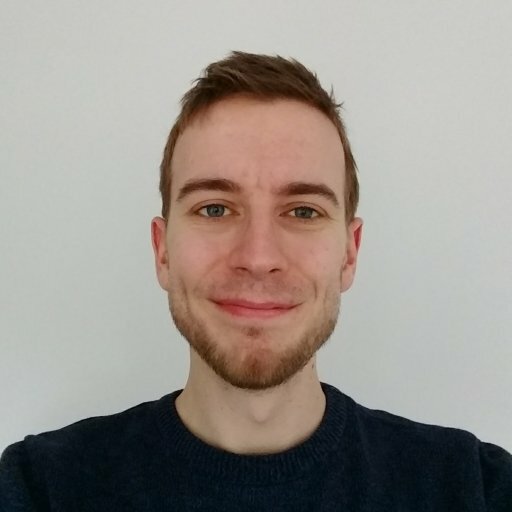 Starlink’s creative director Laurent Malville cited Starfox as a big inspiration, and after giving the game a go ourselves, that love for Nintendo’s classic is readily apparent, though unfortunately muddled at times. During our 30-minute demo we were given free reign to explore the planet Solus, running into groups of mechanoid enemies and disabling storm-generating Extractors. 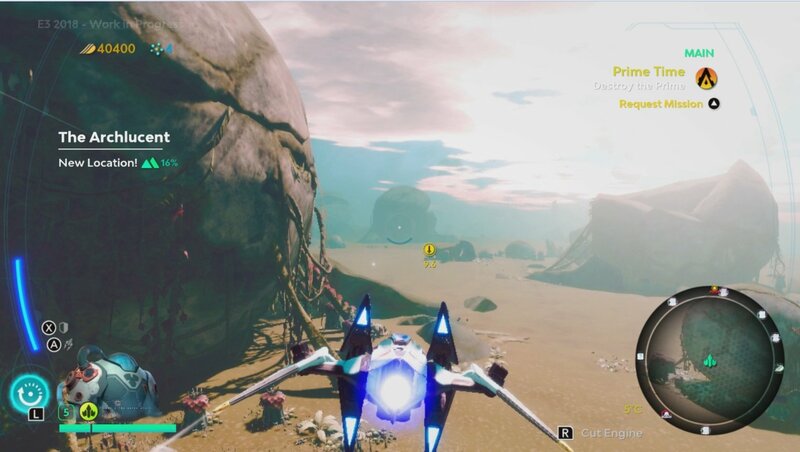 Unlike Starfox, Starlink aims to give players a much more freeform approach. A primary objective is marked on your Hud, but you can also explore the planet at your own pace, scavenging resources and completing quests for allied NPC ships that you encounter, all from the comfort of your cockpit. We could choose between a range pilot protagonists to swap between on our adventure (sadly Fox wasn’t available to try), but it’s your ship that really steals the scene thanks to the game’s Toys-to-life modification system. Much like the Skylanders series, Starlink is designed to be played in combination with real world collectible toys. At the start of the game we were offered the chance to design a ship to our liking. Starting with a pilot, each figurine is placed on a unique controller-attached holder, with the game registering each component you place. In a lovely touch, the core body of the ship — in our case an Arwing which will be included in the Switch release — sits directly on top of the pilot, letting you view the model through the cockpit glass. Modifications include swapping out wings, boosters and weaponry, but the way you attach them is up to you. For example, wings and weaponry can be stuck on backwards, or even stacked on top of each other. 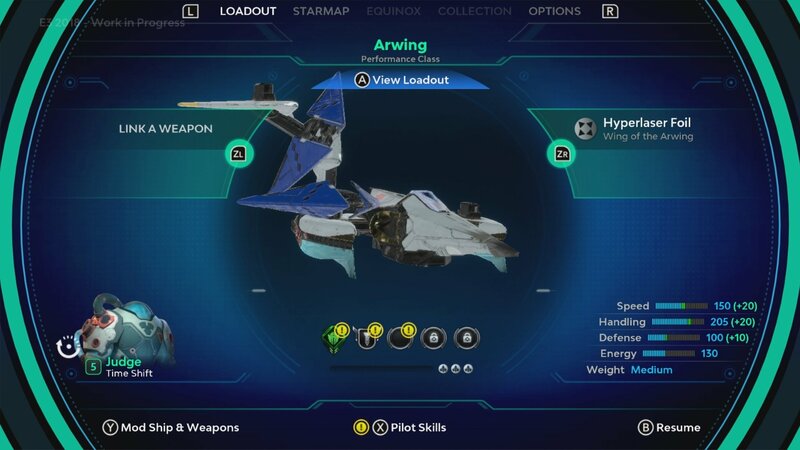 Naturally we took it upon us to create the most impractical ship possible, but Starlink will only let you go so far before informing you that your ship is simply too bad to fly. Still, despite warnings to the contrary we were able to hobble out into space with a notably lopsided monstrosity, wobbling precariously at each attempt to turn. After ten minutes of struggled gameplay, a demo assistant politely leaned in to remind us that we could adjust the ship any time we like and save an awful lot of pain. This on-the-fly modification forms the crux of Starlink’s gameplay, but also one of its weakest elements. At any time you can physically pull off parts of your ship to make adjustments, automatically pausing the game and entering a customization menu. The enemy types you’ll encounter each have weaknesses, and you’re encouraged to change out weaponry as you fight to discover what’s most effective. The figures themselves are impressive and fun to play with, but doing so during the game revived a common problem encountered on Nintendo’s much-maligned former console, the WiiU. Customizing your ship means tearing your eyes away from the screen and down to your hands in a jarringly immersion-breaking experience It’s a design choice that Nintendo’s tablet-and-TV combo never quite conquered, and it still doesn’t work here. Playing around with the full range of toy figurines will no doubt be a fun experience, especially for children, but it’s difficult to get caught up in the plight of a planet when you need to look away from the action and adjust your focus every five minutes or so. Fortunately, Ubisoft has confirmed that the game will include digital-only options, letting you swap in-game between any parts you’ve already registered on the console. Doing so does feel like a betrayal of the game’s main premise, however. The Starlink controller attachment is surprisingly light. Piloting your ship isn’t without its own problems either. Standard controls are matched near perfectly to Starfox, even down to the barrel rolls and looped direction reversals. But where Starfox offers a clear separation between aerial Arwing fights and grounded, Landmaster gunning, Starlink attempts to roll the two into one. Flight is either freeform in the air, or locked to the ground with your ship sliding along the floor. You can swap between the two modes manually, but the game will also automatically snap to the floor if you happen to fly too low. More often than not, attempting a low-flying strafing run resulted in us accidentally swapping to “ground” mode, clumsily bashing into enemies and scenery while staring at the sky, confused as to why the ship hadn't taken off again. There’s a good chance these controls issues will fall by the wayside given more time and experience with the game, but for a first impression it feels far from natural. There’s no ability to stop and hover in aerial mode either, which in an open world game feels like a bit of an oversight. Battling a towering creature towards the end of the demo required getting in close to target specific limbs before unloading on a weak point that opened up on its head. Attempts to take this fight in the air resulted in us drifting too close after shooting the limbs, meaning we either had to turn around and miss out on damage, or crash directly into the beast as we shot it. 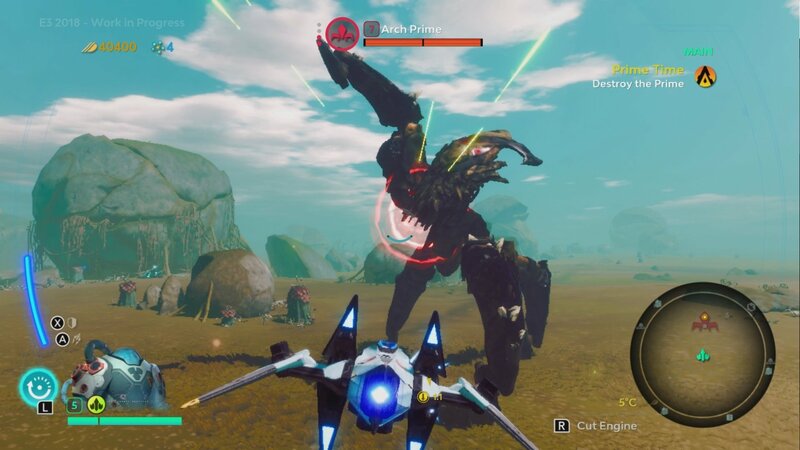 We’re sure that dogfighting will be a prominent part of Starlink, but every combat encounter on Sonatus felt like it demanded grounded combat. Strapped to the floor, Starlink becomes much more like circle-strafing shooter, and at times it feels brilliant. Repeatingly flipping your ship sideways round a group of foes, dodging enemy fire and unleashing a salvo that sends mechs flying is intensely gratifying when it all clicks. Sadly, the close natured camera angle will just as often see you fling your ship sideways into off-camera terrain or other enemies, leaving you spinning upside down on the floor. Starlink’s battle maneuvers seem designed around having the space to move, but most of the enemies we encountered were holed up in derelict structures that made them a mess to fight. Starlink: Battle for Atlas feels so close to being a real blast to play. The controller-attached toys are surprisingly light and impressively detailed. Soaring directly from space to a planet’s atmosphere without a loading screen is a joy, and few will be able to resist cracking a smile as the ship boosters flare dramatically when you shift from the ground back into the air. It’s just a shame that these moments were held back by some odd control decisions and clunky combat. We’d love to experience more of the aerial combat Starlink has to offer, especially with the ability to adjust your ship’s maneuverability as to match your playstyle. Questions remain too over the Toys-to-life aspect of the game. Attacking enemies with the wrong type of weaponry resulted in dismal damage being dealt. Not all the weapons we had access to will be included with the game’s release copy, and it’d be a real shame to see players held back because they can’t afford to splash out on the toys needed to progress. Starfox fans have been waiting a long while for a chance to rekindle their love of arcade-y spaceship dogfights, and Starlink may yet fill that gap. Nintendo clearly sees something in Ubisoft’s new IP, and glimmers of excellence were visible in our time with it, but we’ll need to see an awful lot more before we’re completely sold.